EHS junior Kelsey Casto (32) drives past Belpre’s Hannah Deems (14), during the second half of Eastern’s 63-51 victory on Thursday at ‘The Nest’ in Tuppers Plains, Ohio. TUPPERS PLAINS, Ohio — Revenge, and then some. 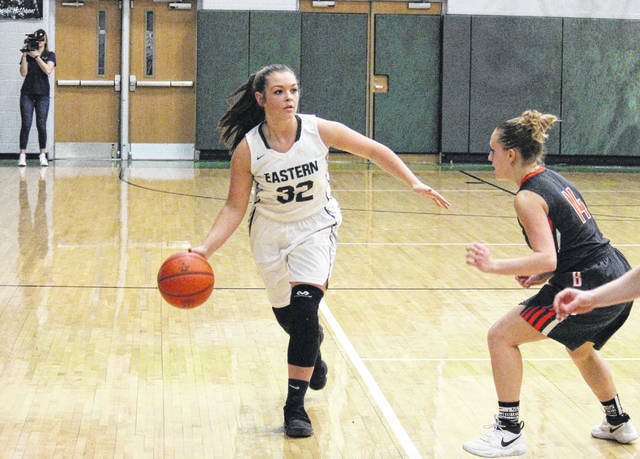 The Eastern girls basketball team — which dropped a 59-53 decision at Belpre on Dec. 16 — avenged that loss on Thursday night in Meigs County, as the host Lady Eagles took a 63-51 Tri-Valley Conference Hocking Division victory over the Lady Golden Eagles. 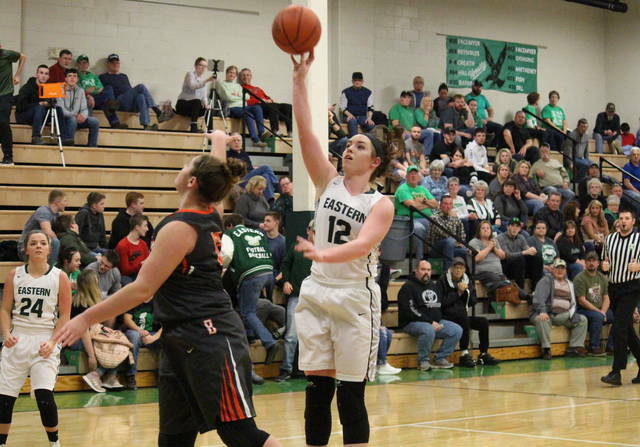 Eastern (10-5, 8-2 TVC Hocking) —which moved into sole possession of second place in the league with the triumph — began the game with a 10-2 run. However, Belpre (10-5, 8-3) ended the opening quarter with a 9-5 spurt, cutting the margin to 15-11. The hosts’ lead grew to 24-17 by the 2:30 mark of the second quarter, but BHS scored seven straight points and tied the game on a Kyanna Ray three-pointer with 1:10 left in the half. A trio of EHS free throws gave the Green, White and Gold a a 27-24 lead at the break. Eastern held its guest off the board for the first 2:45 of the second half, as it pushed the lead to 33-24. The Lady Golden Eagles ended the drought with a back-to-back trifectas, but the hosts widened the gap to 37-30 with 3:13 to go in the third. Belpre closed the third quarter with a 6-2 run and trailed 39-36 with eight minutes to play. By the midway point of the finale, the Orange and Black had cut their deficit to just one point, at 48-47. However, the Lady Eagle defense stepped up and held the guests without a field goal for the next two minutes, in which time the EHS advantage grew to 56-47. With just over a minute to play, the hosts’ lead was at a game-high 14 points. Belpre hit a two-pointer with 15 seconds left for the final points of Eastern’s 63-51 win. “I’m excited to get this win,” EHS head coach Jacob Parker said. “This is a big win, especially headed into the tournament draw. We have a tough schedule and we just have to make it happen to get where we need to be. For the game, Eastern shot 23-of-62 (37.1 percent) from the field, including 2-of-11 (18.2 percent) from beyond the arc. Meanwhile, Belpre shot 20-of-46 (43.5 percent) from the field, including 6-of-15 (40 percent) from deep. At the charity stripe, EHS was 15-of-22 (68.2 percent), including 9-of-10 in the final quarter. Belpre shot free throws at a 5-of-7 (71.4 percent) rate for the game. The Green, White and Gold won the rebounding battle by a 33-to-23 clip, including 16-to-8 on the offensive end. Both teams assisted on 11 baskets, but the hosts claimed advantages of 20-to-6 in steals and 3-to-1 in rejections. Eastern turned the ball over 14 times in total, with 10 of its turnovers split evenly over the middle two quarters. Belpre gave the ball away 29 times in the contest. Eastern senior Madison Williams paced the victors with 23 points and a game-best seven steals. Fellow senior Elizabeth Collins came in with a double-double of 15 points and 15 rebounds, to go with a pair of rejections. 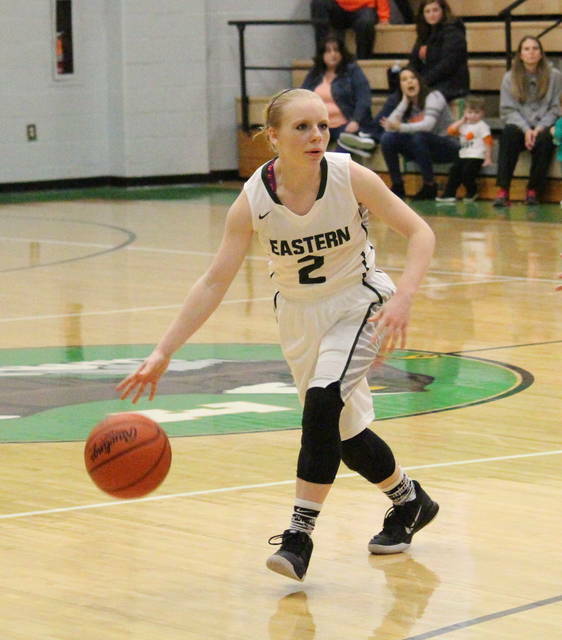 EHS junior Alyson Bailey dished out a game-high five assists and scored 14 points, eight of which came in the fourth quarter. 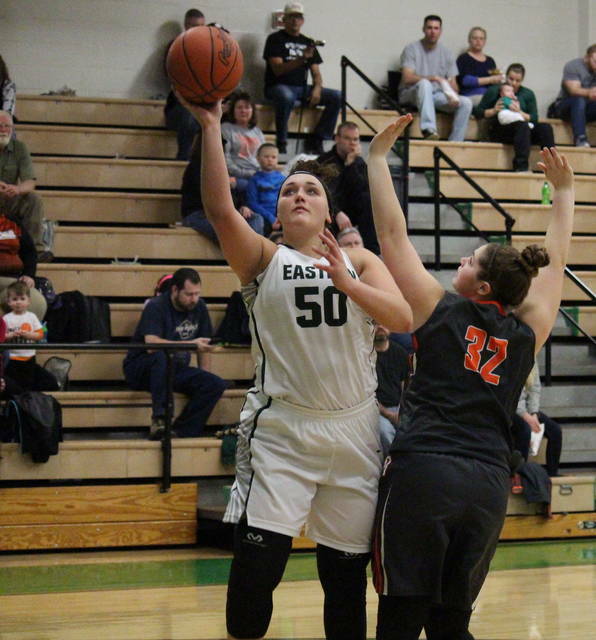 Jess Parker had eight points after going a perfect 6-for-6 from the free throw line, while Kaitlyn Hawk rounded out the Lady Eagle scoring with three points on a key fourth-quarter trifecta. Curstin Griffin led the guests with 13 points, followed by Ray and Kyna Waderker with 11 each. Sydney Spencer had 10 points for BHS, while Abbey LaFatch recorded six points and a team-best four assists. Lakin Hupp’s six rebounds were a team-high for Belpre, while Spencer picked up a pair of steals and Waderker rejected one shot. This marks Eastern’s second win in as many nights, after edging Meigs by a 71-70 count on Wednesday. After a trip to Miller on Saturday for the Lady Eagles’ third game in four days, Eastern will return to action at Wahama on Monday.